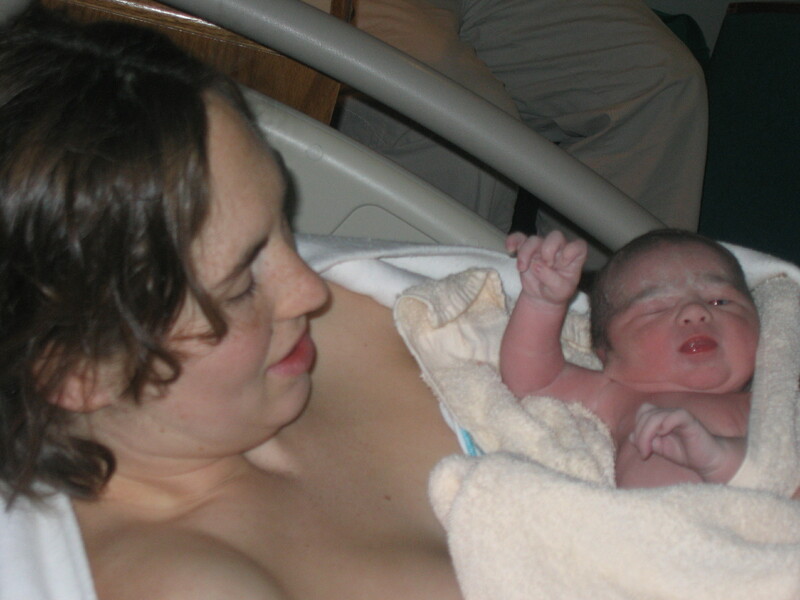 I’ve read many birth stories of women who have wonderful pain-free births. I have to say I was a bit skeptical, and a bit jealous. I’d had two fast labours with easy to manage levels of pain, but there was still pain. I’d have to say I actually went into labour at about 10PM on February 13th. Not active, but as in first contraction. These contractions were well spaced, much farther than the braxton hicks I tended to get. But they made me take notice. I couldn’t sleep through them, but I could sleep between them. So I did. When Ryan got up with the girls I told him to make some muffins, and guacamole for the girls. Pack snacks for them, and get everything ready to go. I tried to get some more sleep. But I was too excited. I was probably, possibly, maybe? in labour. I got out of bed. The contractions pretty much stopped. Ryan and I still continued to get everything ready to go, but I took my time. I got down on my hands and knees to sweep the floor under the table. I had a contraction. We talked again about comfort levels of being at home vs hospital. We talked about what would happen if we showed up at the hospital and I wasn’t in labour, or in ‘enough’ labour. We decided we’d go to the hospital anyway. I had 3 more contractions while in the van on the hour long drive. Though they weren’t very strong. I felt silly for packing everybody up to go to the hospital, especially since our basement flooded the day before and we had a lot of work to do. We debated whether to go to the mall to walk, or to go to the hospital. In the end we decided on the hospital. I figured we could just walk around there and wait to see if I really was in labour or not. I thought I’d have the opportunity to leave if the contractions didn’t pick up. I was still only have a few contractions. They were about twenty minutes apart, but not regular, and they weren’t painful. When we arrived at the hospital we discovered that unless I actually registered I couldn’t get past the ER waiting room. So no turning back, I registered and we were off to the obstetrical assessment unit. No walking after all. When we arrived, 1120, the unit was overflowing. The nurses asked if I was there for a Non-Stress test. I said, no I’m here to have a baby. An induction? Nope, I think I’m in labour. The nurse rolled her eyes, but they have to check everyone. We had to wait in the hall for a few minutes. I burst into tears. No pain, no contractions. Just tears. We were brought to a chair a few minutes later and the assessment started. I was hooked up to monitors and I sipped my Red Raspberry Leaf tea. The woman beside us kept screaming out in pain. The nurses told her she wasn’t in labour yet and she’d have to go home. I looked at my strip, the one contraction I had didn’t register. I was moved to a bed so I could be checked. The nurse asked about me previous deliveries. I told her I was fast. She looked at my strip and asked if I knew I’d had a couple contractions. I said sure I had a couple small ones. She smiled and checked me. She suddenly looked worried. She couldn’t find both sides of my cervix. She guessed I was about a 5. She called to get me a room upstairs. When we arrived at the next unit, the room we’d be checked into was being cleaned. So we went to the family lounge. A couple families sat waiting for their loved ones to give birth. We waited for Ryan’s sister to arrive to help with the girls. I walked up and down the hallway, and Ryan turned on a movie for the girls. 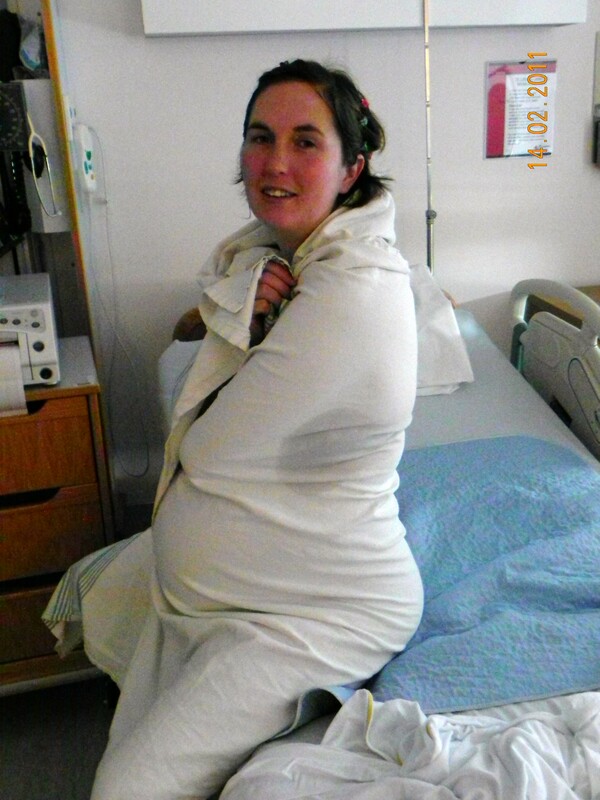 While I walked I had a couple contractions. Enough that I noticed them. Enough that I sometimes stopped walking, but I still wasn’t sure I was in labour. Part of me was afraid they’d still try to send me home, or induce me. The room was finally ready so we went in and the nurse went over a few things with us. Around 1PM Ryan’s sister arrived. Once the girls were comfortable with her and the nurse was finished giving orientation and asking about birth plans, Ryan and I walked. Up and down the hallway. I suddenly realized I was in labour. I felt the pressure. I knew I wasn’t ready to push, but I didn’t think it would be long. My Dr. came to the room to check me. Sometime around 2 I was about a 9. I couldn’t stand to be in the room. I’d tried a shower earlier, but it annoyed me. I went back out into the hall. The nurse insisted I at least bring a wheelchair with me. She didn’t leave my side. I walked passed the charge nurse. Apparently it isn’t very common for a woman in transition to be walking so much, and certainly not common to be laughing and talking so much. I was ‘encouraged’ to stay in front of my room. A few moments later I needed to pee so I went back to the room, unfortunately just as I attempted to sit our little darling decided it was time to arrive. I was stuck. I needed a fair amount of help to get out of the bathroom. Our nurse asked what position I wanted to push in. She did mention that a mother earlier that day squatted at the side of the bed. I opted for side-lying. I was too nervous to try squatting. In hindsight I think I might have preferred it though. My Dr arrived and gowned up before checking me. When she did check, she told the surprised nurse that babies head was ‘right there’. With roughly 10 min of pushing, Cordelia Rose joined us. The only part of my entire labour that I would consider painful was the pushing. And I do believe that wouldn’t have been painful if I’d trusted myself, stayed upright, and had less ‘help’ from the Dr. and nurse. 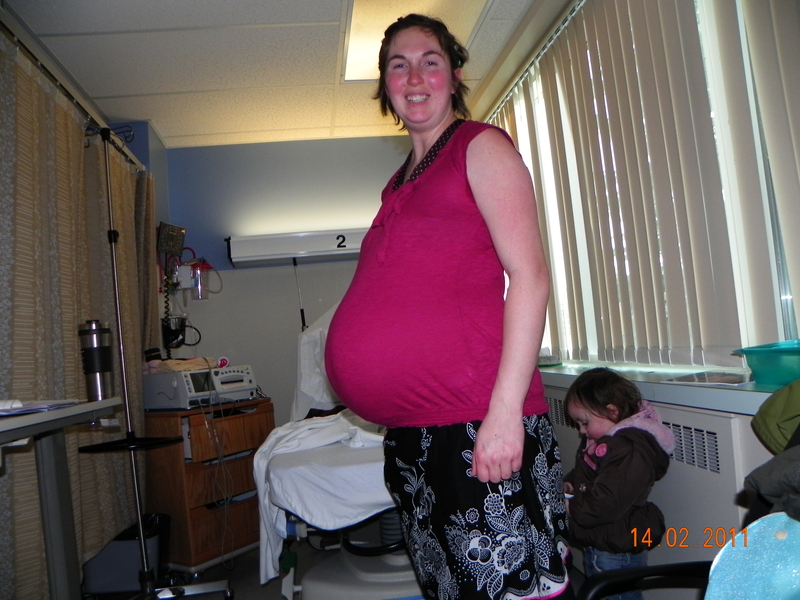 My husband and I are due with our third baby Feb 12th and are preparing for an unassisted home birth. I am wondering if anyone has information, or personal experience they could share. I had planned to use a midwife, but that didn’t work out. I am currently seeing an OB, however I have very fast L&Ds (My longest labour was 3 hours from 1st cx to baby). My first birth experience was not exactly what we wanted, but over all things could have been worse. Our second was a beautiful experience, but also int he hospital, with the same OB I’m seeing now. Our current concern is that if I go into labour at home, I will not make it to the hospital in time – and I don’t want to deliver on the side of the road. MY OB agrees that delivering at home unassisted would be better than the roadside : ) She also agrees that inducing isn’t a better option. Obviously she’d prefer me to be at the hospital, but is on board for helping us, in what ever way she can, to have a safe UC. However, as of right now I don’t really know what we should do to prepare. We don’t really have a plan (other than 911) for what to do if baby is compromised at birth. Both my husband and I know infant CPR, I have my NRP, but my husband doesn’t. We also don’t have things like O2 or bag & mask – we’d hope that there would be minimal wait time in the event we needed an ambulance, but sometimes there is a wait. Also my husband is working until my due date so there is a possibility I’d be delivering on my own – he works roughly 30 min from home. I’m not overly concerned about the safety, about the outcome. I actually feel very positive about it, however, I do know that sometimes things happen unexpectedly and want to be as best prepared as possible. My OB is openly discussing this with us, however I think we both hit the same thought – if something happens, hope that the ambulance arrives quickly. Last night I dreamed I gave birth. Not surprising considering I hit full term this week. Also not surprising since I’ve spent the last several days looking up everything we might need to know in order to deliver on our own. My dream consisted of me getting up out of bed, unable to sleep. The girls never stirred, so I decided to indulge in a shower that would last more than five or ten minutes. I placed some towels into the dryer to warm them up, then hopped into a nice steamy shower and there I stayed. The contractions started. After a few minutes I climbed out, wrapped myself in a warm towel, and had a baby. I nursed immediately and everything was perfect. Ryan finally got home from work in time to help clean everything up and tuck me and the new baby into bed. It was a nice dream. The outcome was exactly what we hope for – a health mom and baby. Now the questions remain: What will really happen? Where will I really deliver? Will Ryan be at home, or work? And the biggest question of all: When will we meet our little Dandelion?